Do you love the Tahoe Keys but hate paying for an big expensive house? .....Then this is your condo! This single level and very cozy condo in the heart of the Tahoe Keys on the Marina and with views of Heavenly's slopes is the perfect place to relax after a day of playing in South Lake Tahoe. The open concept living room and kitchen keeps all guests in one place to gather for meals, games and making memories. You can literally cook while chatting the night away with your guests. The kitchen, family room and dining table are all in one big space! The updated kitchen provides all that is needed for the cook in your party or use the patio and grill your dinner. The counter tops are granite and the cabinets are new. The large wood fireplace provides a focal point and area to get warm on those cold, snowy days or brisk summer nights. Off the living room is a patio for BBQing and just a few steps from there you can reach the marina and take in those Tahoe sunsets. We just put a brand new GAS BBQ and bistro table on the patio. You can see the water from the couch or patio! What sets this condo apart from the others in the complex is the privacy factor. You only have one shared wall and no one on top of you so unlike the other Ala Wai condo's this one is very private. With the two bedrooms, 1.5 baths and laundry room, this condo makes the ideal getaway. Its close proximity to the Tahoe Keys club makes it an easy walk to the pool, clubhouse and beach. Accommodates a small family or group of friends comfortably. "The location of the condo is everything -- close to biking trails, Tahoe Keys pool and playground, restaurants, fitness and yoga centers, and a short walk to the beach." 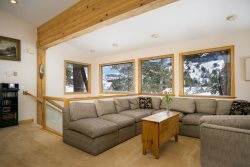 "The coziness of this condo along with the close proximity to all Tahoe Keys amenities made it the perfect place for our family to vacation both winter and summer." - Tahoe Keys recreation and swim center for a fee. Fees are $7 per person per day; access to outdoor pool, indoor pool and 2 spas, beach access, volleyball and children's playground area. Passes must be purchased at the Tahoe Keys Property Homeowner Association office located at 356 Ala Wai Blvd. between 8:30 am and 4:30 pm 7 days a week. Fees subject to change by the TKPOA. Didn't have a need to contact you at all. Everything was perfect. The location was great. We had a boat and it was so nice to look at it in our back yard in the marina. It was very easy to go to the lake.